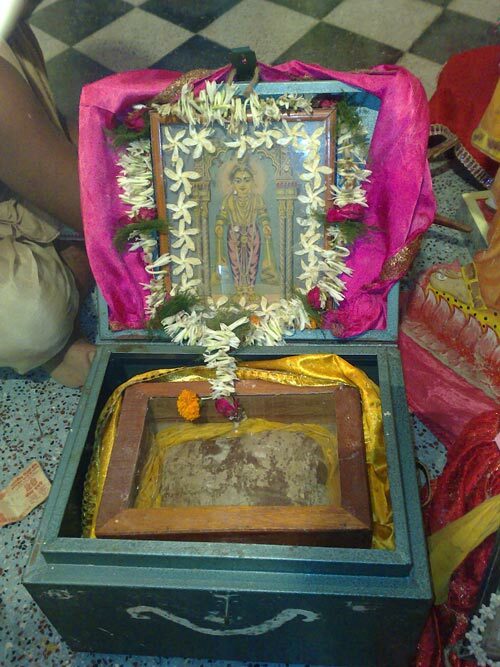 Quite unexpectedly, on the auspicious occassion of Naga Panchami (the traditional day for worshipping snakes and Nagas), a divine Naga appeared at our Sri Jagannatha temple in Bhadrak, to bless devotees. 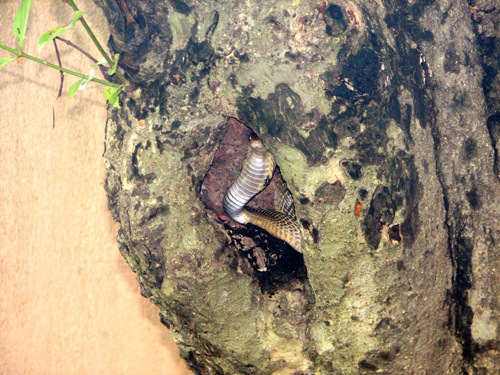 The cobra was first seen early morning, around 5 a.m., inside the hollow of a Kadamba tree next to Sri Jagannatha’s altar. 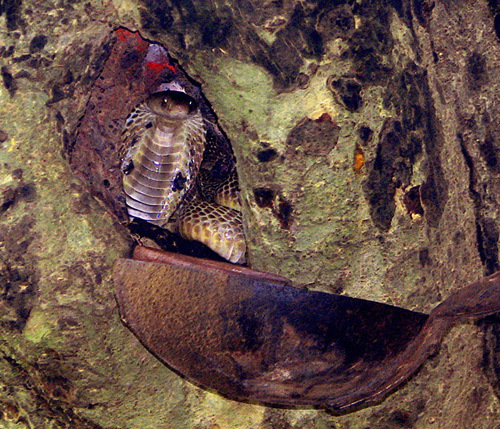 At first the devotees could not identify that it was a Naga and thought to chase it away, as there are several other types of poisonous snakes in this area. There were many attempts to tap it softly with a long stick so that it would leave and not endanger anyone, but it did not react at all. Even after trying to chase the snake away for more than half an hour, repeatedly tapping it with a long pole, it remained silently coiled in the tree, completely ignoring attempts to get it to leave. After many attempts, a 90 year old traditional snake expert came and confirmed that the snake was a Naga and would not harm anyone. 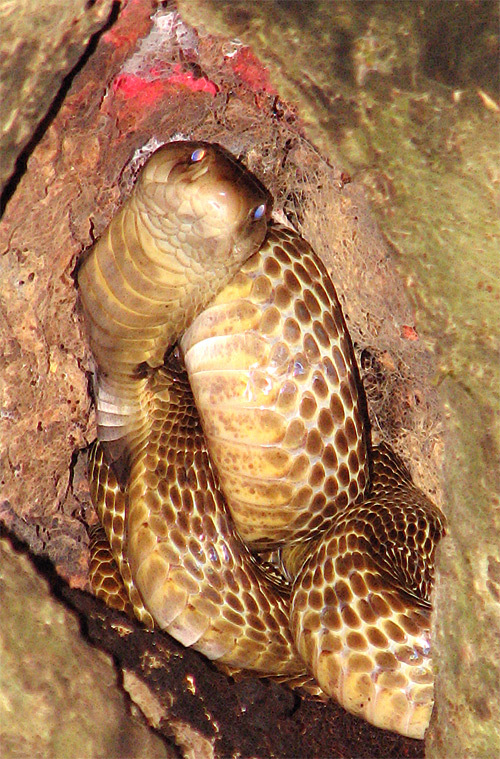 He approached the tree and bowed his head against the opening in the tree, just inches away from the cobra. 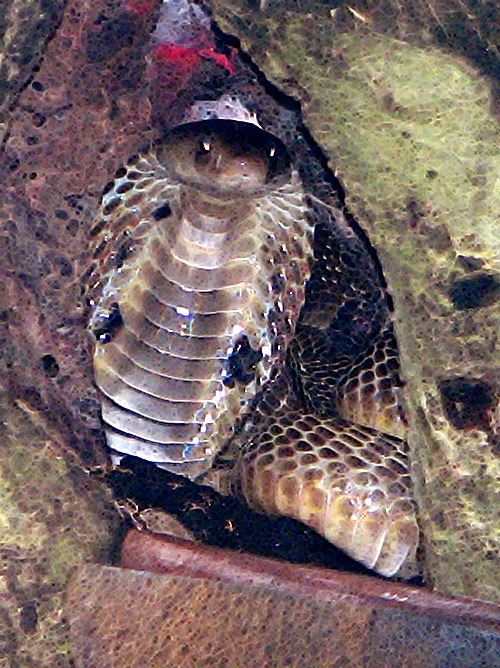 The cobra was not at all disturbed by his presence and did not react even though his head was just a few inches from the snake. 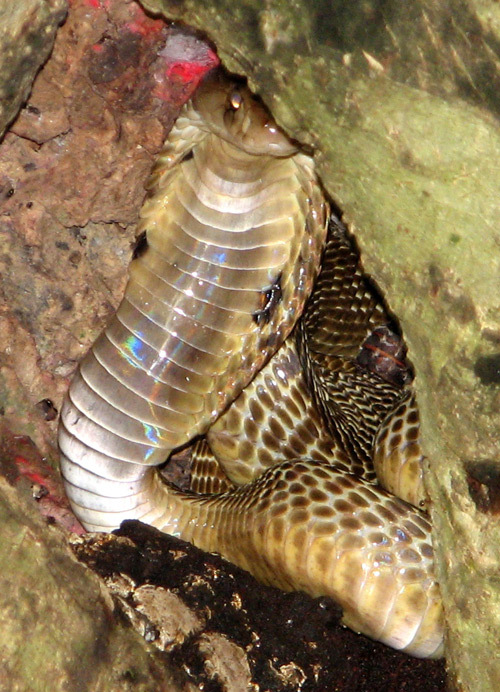 He informed us that today was Naga Panchami, and that this snake must not be an ordinary snake. Frank incense was then brought to offer to the snake to see if it was truly a Naga. As soon as the large pot of frank incense (sambrani/jhuna) was offered to the snake, it immediately stood up and opened it’s hood wide, making a large hissing sound. 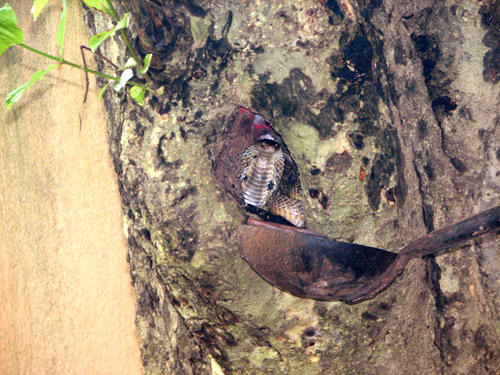 After a few minutes it again lowered its hood and sat silently inside the Kadamba tree, sitting peacefully throughout the entire day and night. As word spread, more than 1,000 villagers arrived throughout the day and night, bringing offerings of milk and deepams, to receive the blessings of the Naga. 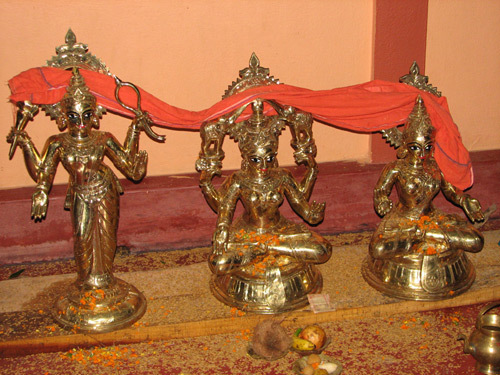 In Orissa, Nagas are considered as signs of Lord Shiva (Akandalamani). With the recent installation of Sri Vimala Devi (Durga), the Naga is seen by the villagers as the divine presence of her husband Lord Shiva. 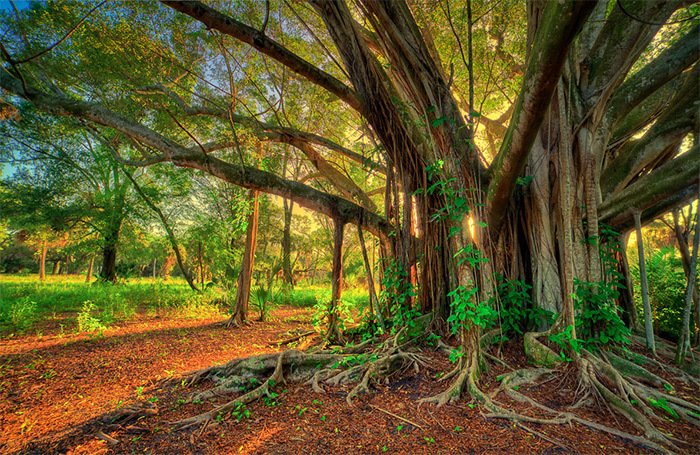 By nightfall, when the temple was closed, the Naga was still sitting inside the hollow of the Kadamba tree. The next morning when priests went to awaken the deities of Lord Jagannatha, the Naga was no longer present. He came only for the occassion of Naga Panchami, and sat silently the entire day and night to give darshan to all of the visiting devotees. 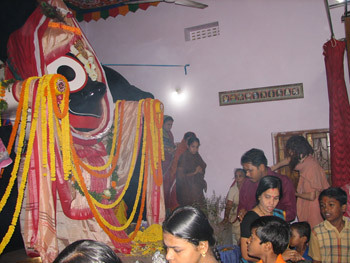 In Lord Jagannatha’s temple in Puri, Nagas are said to guard the deity’s treasure chamber. Below the temple there are secret rooms that no one is allowed to enter, and these are used to store the Golden Dress (Suna Vesh) as well as many other jewels that belong to the deity. These chambers are filled with divine Nagas who guard the Lord’s treasury. 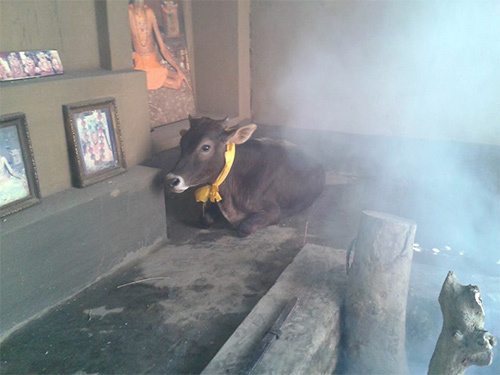 Only one person will be allowed to enter this treasury, and he can do so only after fasting, performing specific austerities, and offering prayers. Once the nagas have been satisfied, the pujari is then allowed safe passage to collect Lord Jagannatha’s jewels and dresses. Thus the celestial Nagas have been tied to the service of Lord Jagannatha for thousands of years. We have so many instances in the past too of the like. I believe it and bow my head before Naga Deva .